Developed by Ginge-Kerr over 10 years ago, the Argonite system is a viable, environmentally friendly alternative to Halon. Argonite is effective against fires in almost all combustible materials and flammable liquids, and has been tested and approved by regulatory bodies throughout the world. Argonite is also particularly suitable for use in areas where the use of water, foam or powder would be unacceptable. Based on the principle of oxygen depletion, Argonite is an inert gas that extinguishes fire. In an enclosed space almost all fires are extinguished in less than 60 seconds when the oxygen concentration falls below 15%. Argonite manages to reduce the oxygen concentration to approximately 12.5%. This oxygen concentrations is an acceptable level for human exposure over short periods. • Extinguishant hold times are greatly increased. • The need for room sealing is reduced. The physical removal of oxygen from the atmosphere is how Argonite manages to extinguish fire. For short periods of time at design concentrations, people can breathe safely in occupied areas. Argonite will not decompose or produce any byproducts when exposed to a flame. There are no toxicological factors associated with the use of Argonite. Additionally, there is no fogging effect and so there is no effect on visibility when Argonite is used. Argonite has zero ozone depletion potential (ODP) and zero global warming potential (GWP), making it environmentally neutral. Argonite is a colourless and odourless gas. A choice of fills and pressures is available with the range of cylinders offered. The latest LPCB approved 300 Bar system offers significant space saving over an equivalent 200 Bar system. High strength alloy steel is the material used to manufacture each cylinder. The requirements of various national authorities, including the stamping and certification are met with each cylinder produced. 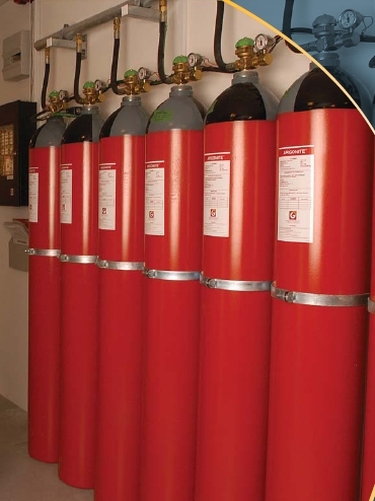 Mounted in rows, the cylinders can be installed in any suitable location. The cylinders can even be installed over 100 meters away from the protected areas. Argonite discharge valves are manufactured from corrosion resistant brass. The discharge vales have been built to ensure optimum system performance, reduced pipe sizes and low installation costs. The discharge valves can be actuated either electrically, pneumatically or manually. The recharge the cylinders without the need for replacement parts has been made easy, as the valve design allows a worldwide network of distributors to use them. Fitted as standard, a pressure switch allows remote monitoring of the system's integrity. There is also an easy-to-read gauge that lets a user conveniently inspect the agent pressure. Connected via a common manifold, Argonite systems consist of one or more cylinders, usually at 300 Bar pressure. System actuation can be manual or automatic and the gas is discharged through a pipe network and enters the protected area via nozzles. The correct amount of Argonite is released effectively by a combination of system design, the quantity of gas used, together with computer calculated pipe and nozzle dimensions. A fire is quickly extinguished due to Argonite's inerting and extinguishing properties. A single Argonite system is suitable if more than one area within a building needs to be protected. The Argonite system is designed to extinguish a fire in the largest room, can be used, with automatic valves directing the Argonite into the required protected space. This can provide significant cost and space savings, provided that there is low risk of more than one fire within the facility at any one time. The protection of fixed equipment and plant is ideally suited for the Argonite systems. Where fires can have devastating consequences, beyond the cost of damage and lost production, they are particularly applicable. Argonite has been approved and/or complies with major international authorities and classification bodies.